This weekend has been exactly what I needed – after spending Friday in bed knocked down with food poisoning, we had a nice lazy weekend at home with lots of lazy sleep ins! Luckily the extra rest paid off and I still managed to squeeze in a bit of socialising and baking, so despite beginning badly it ended up being a pretty lovely weekend! – Finding today a little hard? Then check out this list of 27 animal facts that are guaranteed to brighten your day. – Here’s a DIY project I can’t wait to try – how to make little gift boxes out of paint samples! – As bad as it is, I love indulging in a bit of celebrity gossip. One of the best things I stumbled upon this week was this list of what celebrities were voted in the high school yearbooks – best part is it’s interactive, so give it your best guess! – Got a bunch of doilies lying around that you don’t know what to do with? 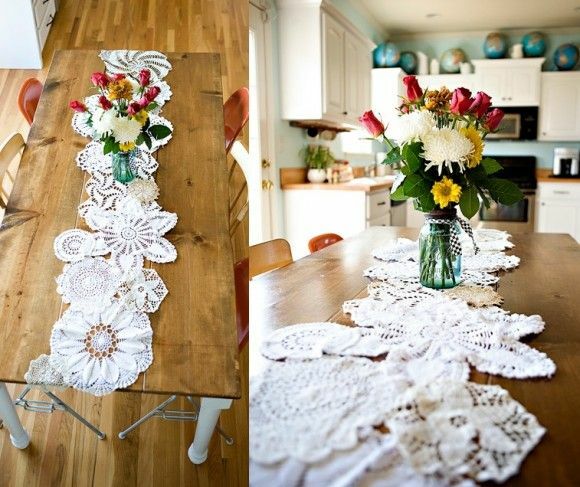 Why not make a table runner like this one – gorgeous! – Want to bake mini cakes but don’t have any tins? Then try this recipe to bake them in old cans!